If you are struggling with digital branding, looking for an online community for support, networking, or relationship-building, we’ve got some great news! Our digital branding community is here! Now, you’ll have a place to interact and connect with us and your peers, on Facebook and LinkedIn. What’s our digital branding community? We’ve created groups on Facebook and LinkedIn where you can engage and talk to us and peers about digital branding! You get to learn from experts, share your business, ask questions, give advice, and more. You won’t want to miss this. Read on to learn more about these communities and how you can join! Why Join Our Digital Branding Community Facebook group? It’s another venue to connect with others and talk about digital branding. Digital Branding Institute is a place to learn, grow, network, and improve your business through digital branding. Join the group! Next, check out the ground rules. Digital Branding Community is a place for support. Be respectful and kind. The members of this group are at all different stages in business. Our goal is for this group to be a community where members have the opportunity to openly ask questions, provide advice, network and make friends. Any posts that look like an attempt to self-promote will be deleted without warning. Share what you’ve been up to lately. What’s your latest project, business venture, or idea? What have been your struggles? Don’t be shy. Ask your questions, ask for advice and feedback from the group. Group members are available with a wealth of information and we’ll be available as well to chime in. What successes or big wins are you celebrating? Share with the group. Wednesdays are for social media! This roundup day will host a thread that will let you share one social network (example: Facebook, Instagram, etc.) you’d like to grow. Reciprocation is mandatory. This means if you share a social network you’d like group members to follow, you must follow that member back. Looking for a partner, guest posts, volunteers? Post your request in this thread on Thursdays. Fridays are for promotion! This thread will allow you to share your website, business, or brand. Make sure to hang around and check out other group members’ shares as well. What better place to connect with like-minded individuals in a professional environment? Learn from others, pick the brains of experts, interact, and engage. Connect, share, and network with peers. You are given an opportunity to help your business gain more exposure, boost online presence, and reputation. You’ll get a chance to learn more about digital branding and use it to help your business. We mentioned networking above but beyond that, you get a chance to meet some incredible business professionals. You can make friends, find partners, get customers, and make some incredible connections. We are looking for you to create a guest post about our digital branding communities. This will also give you the opportunity to establish credibility in this field as well. Be sure to take some screenshots of the community engagement as I think it will enhance the article. There are members of our community, who have varying levels of experience to share. Many of them might be in the same stage of digital brand building that you are! Rather than introduce yourself in a separate post, please do so in the comments section of the pinned welcome post, so we have them all in one place. Tell us a bit about yourself—your name, what your platform is all about, and a link to your website or blog. Feel free to use this Facebook group to ask questions, share your wins and your challenges, and encourage others with likes and comments. Please keep all posts relevant to platform-building and the content of Digital Branding University itself. Absolutely no Facebook Live posts are allowed inside the group. Remember: This community should be used for encouragement, feedback, and connection…NOT brand/platform promotion. One last note: Some of our community members may not share your worldview or understand your jargon. Please remember to be kind and welcoming to ALL students, regardless of their faith (or lack thereof). Use a wide array of media: video, posts, and photos. This makes a difference. You don’t want to post the same things over and over again. Vary it up! You’ll notice a change in engagement by doing this. Respond to group members quickly and interact. This will help boost the engagement of the group. Engage, engage, engage. Talk to members, ask open-ended questions, take polls, and surveys. These are all activities that help create an engaged community. 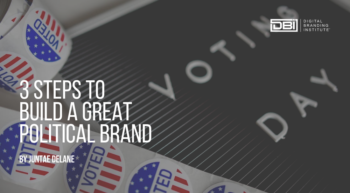 DBI Tip: It pays to be a digital branding community all-star. You have the change to be noticed by the DBI staff and coaches which may lead to great opportunities. Such as prizes, discounts, and employment! We are thrilled to launch and share our digital branding community on Facebook and LinkedIn with you! You’ll find these groups to be hugely supportive and a great opportunity to learn, meet new people and build your online presence and reputation. Join us today! Are you already a Facebook or LinkedIn group member? Share with us your favorite types of groups that you belong to.